Taking every leftover container out of the fridge and dumping it into a soup pot isn’t always a safe technique (or a good idea), but in this case it turned out to be the right thing. We had a few braised short ribs left, and I wanted to stretch them out into a full meal. 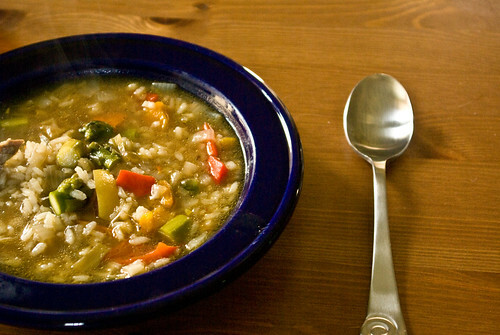 I had a few other things to use up, and I decided that soup would be perfect, with a slight middle-eastern slant to it. I started the soup with a bit of onion and garlic sizzled in olive oil, then added a sprinkle of ground cumin and hot paprika. Half a preserved lemon went in, roughly chopped. I thawed a container of broth made from 7-spice roast chicken, so it had a bit of sweet cinnamon flavor to it, and added it to the pot, then stirred in short grain rice and let it simmer. When the rice was almost done, I added the cut-up short ribs and their juices (including braised leeks), some roasted bell peppers left over from tacos, and some cooked asparagus and roasted fingerling potatoes. A random assortment of stuff, maybe, but it pulled together beautifully in the spiced broth, with the rice as the unifying theme. Delicious, warming, and cheap.